As a result of investments like this, rarely a week goes by without news of the incredible discoveries taking place in the College of Science. In August 2006, OSU zoology faculty described their research findings regarding another aspect of global warming. Their study could help improve the accuracy of projections about the impact of climate change, particularly the shifts regarding where different species can live and survive. • Renovating the human anatomy and physiology laboratories with new microscopes and downdraft tables so that 700 undergraduate students per quarter can study and understand human anatomy at both the actual gross and histological levels of resolution (the only program in the Northwest with this capacity). This opportunity positions our graduates for high acceptance rates by prestigious medical and dental schools. • Modernizing the geosciences ice core laboratory, where internationally-renowned faculty and their graduate students study greenhouse gases, harvested through ice cores in Antarctica, to learn about millennial-scale changes in global temperatures. We ask that all of our donors consider a gift to the Renaissance Fund in addition to targeted options for their philanthropy in Science. • Designation of a portion of an estate. Make an annual gift by designating the College of Science Renaissance Fund when you respond to mail from the OSU Fund or phone requests by OSU student callers. Annual gifts of $1,000 or more qualify donors for membership in the President’s Circle, Oregon State University’s premier donor club. Advances in basic science and mathematics create knowledge for technological change, form a foundation for economic development, and lead to improvements in community health. 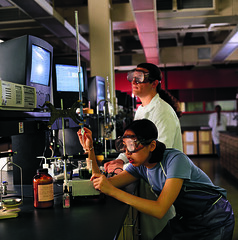 The College of Science fosters the understanding of science and mathematics as essential for decision making by critical students, involved faculty, and an informed public.